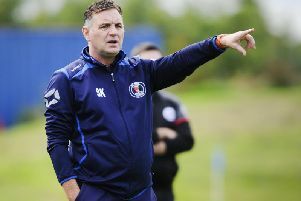 Bo’ness United have moved swiftly to appoint Steve Kerrigan’s successor by naming Max Christie as the new boss. Ironically, Edinburgh-born Christie (47), joins the BUs having managed the Tranent team which thrashed his new employers 5-0 in East of Scotland Conference B on Saturday. Christie, who also formerly managed Bonnyrigg Rose and Broxburn Athletic, had a 16-year playing career as a midfielder which ended in 2003 when he was on the books of Dundee. Joining Max on the BU coaching staff are Ian Black and Kevin Haynes. But Andy Shirra and Stuart Hunter will lead Bo’ness for this weekend’s fixture at runaway leaders Bonnyrigg Rose.